This is one smart high chair that converts to every chair baby will need because the Trio 3-in-1 Deluxe High Chair, is three chairs in one! Three modes of use include a full-size high chair, booster seat, and toddler chair... all in one chair! Its versatile design makes it perfect for dining at home or a restaurant. The cute Piper fashion is perfect for girls, and complements your home decor. The EasyClean removable and dishwasher-safe tray features four locking positions and a removable bolster insert for a better fit as baby grows. The high chair and booster seat include a five-point harness and the toddler chair has a three-point harness to keep baby secure. 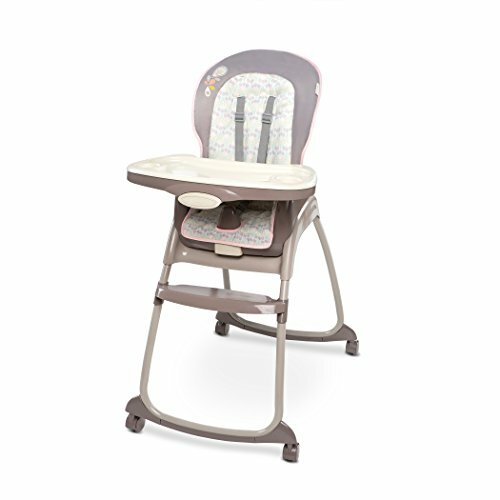 The high chair accommodates toddlers up to 50 pounds and includes a easy to clean seat pad for easy clean up. When used as a booster and toddler chair, the Trio 3-in-1 Deluxe High Chair can even seat two children at the same time. Designed with parenthood in mind.